From time to time we like to share new work we're adding to our portfolio, today we'd like to show you the COVERGIRL & Walgreens Hunger Games District Look Quiz. In this promotion fans of The Hunger Games: Catching Fire answered a series of questions about their style and favorite features to reveal their Hunger Games District Look. Throughout the experience, available on both a microsite and a mobile-optimized site, consumers watched video tutorials to create their look and view relevant products. 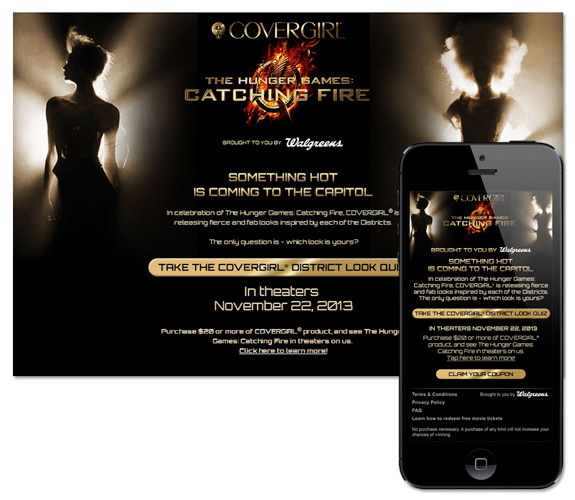 Additionally users who submitted a $20 COVERGIRL receipt were given a ticket to the movie and participants on mobile devices received a COVERGIRL coupon. This promotion gave COVERGIRL and Walgreens a way to drive sales and encourage exploration of new products. By aligning the brand with a movie franchise popular with their consumers COVERGIRL was able to make the content truly relevant to their consumers. 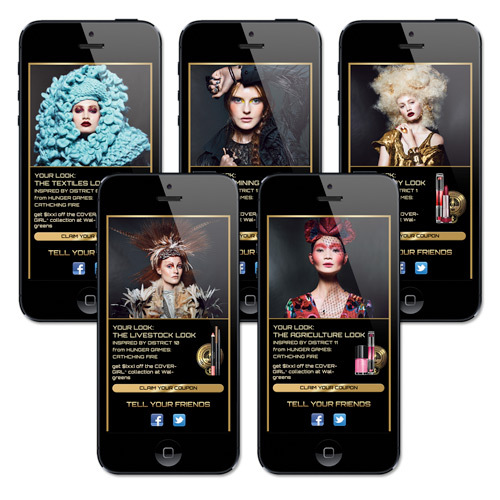 To see more of our work, check out the portfolio here.